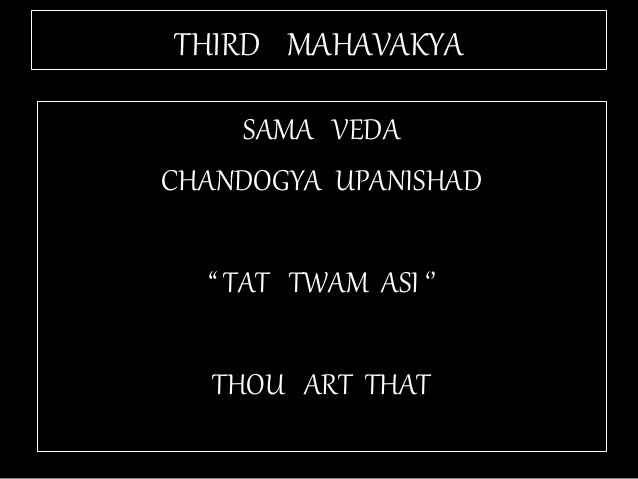 FIFTH MAHAVAKYA – TAT ASMI PRABHO – PRINCIPLE OF DEVOTION: The Fifth MahaVakya emerges from analysis of Four Great Upanishadic Aphorisms(MahaVakya Chatushtaya). Aphorism refers to a short, concise statement of principle. 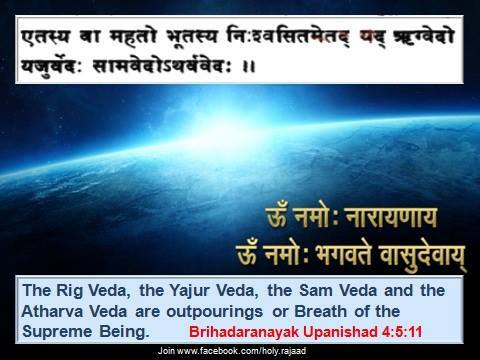 The ‘Upanishads’ are commentaries on texts called Rig Veda, Sama Veda, Yajur Veda, and Atharva Veda. 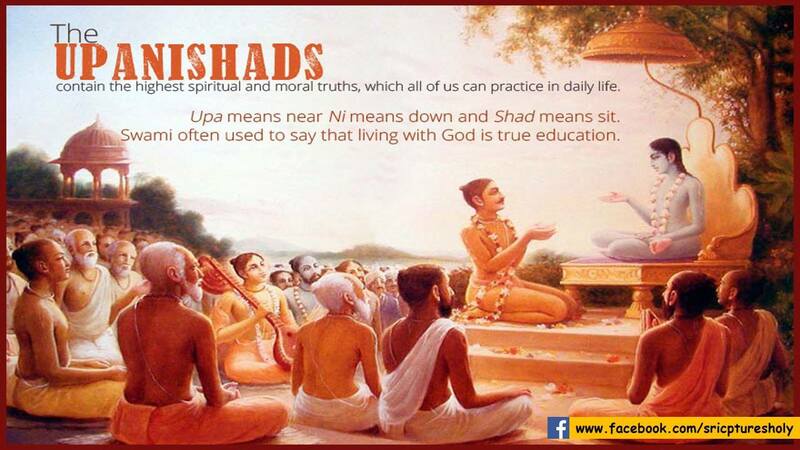 The Upanishads include four short, pointed sentences expressing a general truth. These Upanishadic Aphorisms are popularly known as ‘MahaVakya Chatushtaya’ or Four MahaVakyas. These four statements are primarily concerned with man’s true or real identity or ‘ESSENCE’ and relate that identity to God’s true or real identity. If man and God have the same identity, we have to reconcile that identity to account for man’s existence in real world as a mortal, physical being. We need to explore the possibility of separation, distinction, or differentiation of two identical entities on the basis of things they do for their ‘EXISTENCE’. The term ‘essence’ accounts for what you are, and the term ‘existence’ accounts for what you do. Existence always precedes Essence, and if there is no Existence, the Essence of entities will not be known. 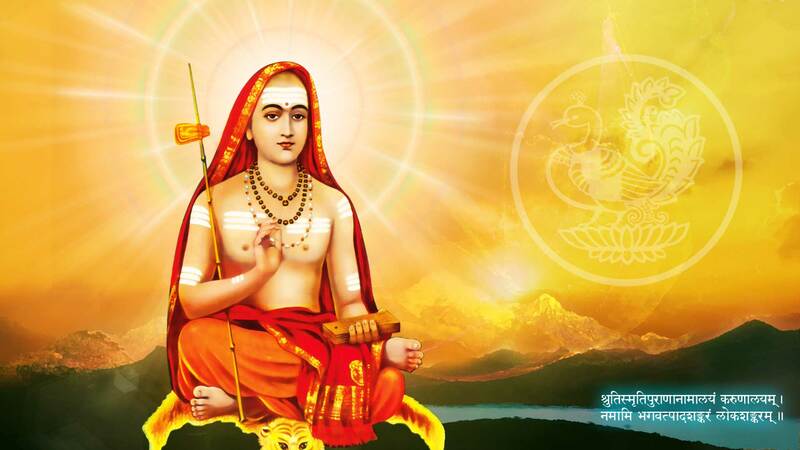 The Fifth MahaVakya, “Tat Asmi PrabhO” is attributed to great Indian teacher known as Adi Shankaracharya, the founder of Indian School of Thought called “ADVAITA” or Non-Dualism. While man and God are of the same kind, the distinction, or differentiation between the two entities is that of degree. Man – God Dualism may account for two different types of existence; man’s conditioned existence, and God’s unconditioned existence. FIFTH MAHAVAKYA – “TAT ASMI PRABHO” – PRINCIPLE OF DEVOTION: MAN – GOD DUALISM. MAN IS A CONSCIOUS BEING. THERE IS DISTINCTION BETWEEN INDIVIDUAL CONSCIOUSNESS AND UNIVERSAL CONSCIOUSNESS. Man is a conscious living entity. Life can be defined as ‘Knowledge in Action’ as all living functions involve application of knowledge to perform sequential, purposeful, goal-oriented, guided, predictable actions to provide benefit to the Individual who lives because of those actions. God is the Source of Knowledge and there is distinction between Individual Consciousness and Universal Consciousness. 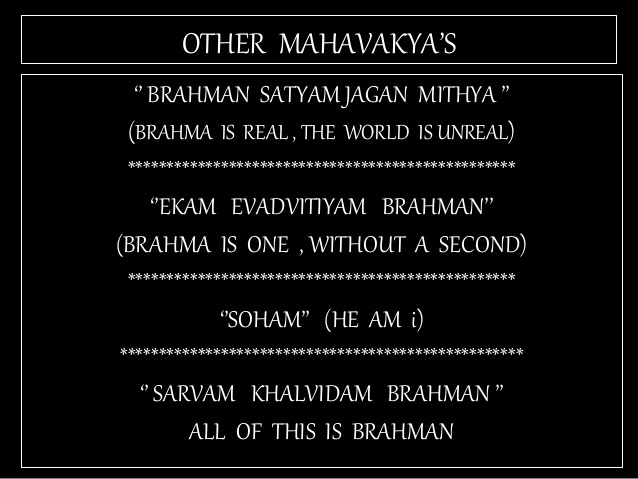 FIFTH MAHAVAKYA – “TAT ASMI PRABHO” – PRINCIPLE OF DEVOTION: ATMAN IS EMBODIED SOUL. ATMAN IS MODIFIED BY THE BODY IN WHICH IT RESIDES. IN TERMS OF NATURE, INDIVIDUAL SOUL IS IDENTICAL TO GOD, FOR BOTH SHARE SAME ATTRIBUTES LIKE IMMUTABILITY, IMPERISHABILITY, IMMORTALITY. AND YET ATMAN IS GOVERNED BY RULES FOR ITS EXISTENCE. There is fundamental distinction between Individual Soul(Atman or Jeevatma) and Supersoul or Paramatma. In terms of nature, Individual Soul is identical to Supersoul or Paramatma or God for both share same attributes like Immutability, Imperishability, and Immortality. Atman is embodied soul. Atman is modified by the body in which it resides. The difference between Atman and Brahman is that of variations of existence as Atman is governed by rules for its existence. 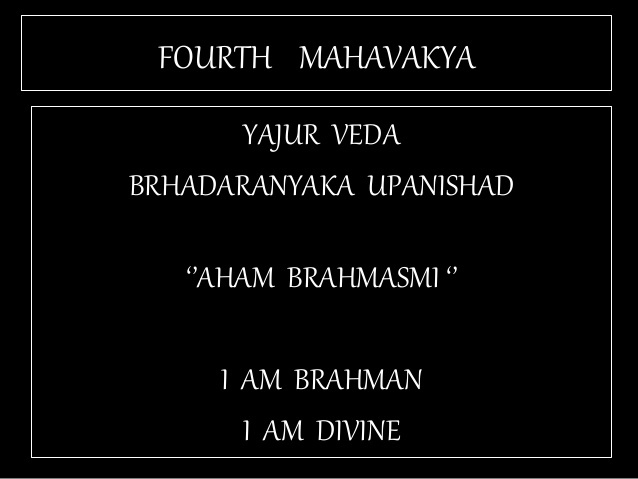 FIFTH MAHAVAKYA – “TAT ASMI PRABHO” – PRINCIPLE OF DEVOTION: MAN – GOD DUALISM IS TRANSCENDED BY MAN – GOD CONNECTION, PARTNERSHIP, RELATIONSHIP, ASSOCIATION, BONDING, OR YOKING THAT BRINGS THEM TOGETHER TO GIVE A SINGLE, HARMONIOUS EFFECT. Man – God Dualism, Atman – Brahman Dualism is transcended by man – God connection, partnership, relationship, association, bonding, or yoking that brings them together to give a single, harmonious effect. This statement, “Tat Twam Asi” or ‘Thou Art That’ is a truth that derives its reality from fundamental Unity, an operating principle that makes man – God Connection. For all practical purposes, the division, distinction, or differentiation into two separate identities becomes redundant. FIFTH MAHAVAKYAS – “TAT ASMI PRABHO” – PRINCIPLE OF DEVOTION: INDIAN TRADITION RECOGNIZES OTHER MAHAVAKYAS AND NONE OF THEM, INCLUDING THE FIRST FOUR, GIVE A FULL DESCRIPTION OF LORD GOD CREATOR. THEY DESCRIBE ONE FACE OF A COIN WITH TWO-FACES. Indian tradition recognizes several other ‘MahaVakyas’ and none of them, including the first four(‘MahaVakya Chatushtaya’) give a full description of LORD GOD CREATOR. Upanishadic Aphorisms describe one face of a coin with two-faces. Identity and Essence is one face of a coin and Existence is second face of the same coin. We have to learn about both faces of coin. FIFTH MAHAVAKYA – “TAT ASMI PRABHO” – PRINCIPLE OF DEVOTION: MAN – GOD DUALISM. MOON SHINES IN THE NIGHT SKY AND SUN IS THE ORIGINAL SOURCE OF MOON LIGHT. 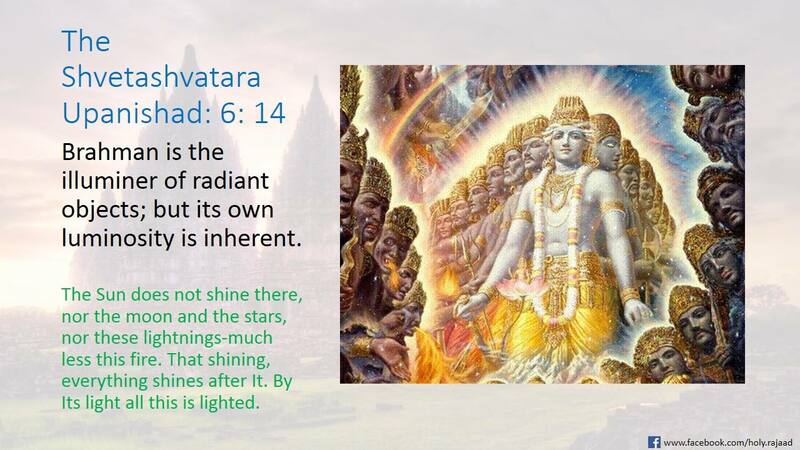 GOD OR BRAHMAN IS THE ORIGINAL SOURCE OF LIGHT AND ILLUMINATION. Man – God Dualism can be recognized by noting difference between Moon Light and Sunshine. There is an Original Source of Light and Illumination and it is not illumined by any other luminous object. FIFTH MAHAVAKYA – “TAT ASMI PRABHO” – PRINCIPLE OF DEVOTION: ATMAN IS BRAHMAN AND YET THEY ARE DIFFERENT FOR GOD HAS NOT ATTACHED HIMSELF TO THINGS THAT HE CREATED. THERE IS CONSTITUTIVE UNITY BETWEEN ATMAN AND BRAHMAN. BUT THERE IS REGULATIVE DUALISM BETWEEN THEM AS GOD IS ULTIMATE CONTROLLER, SUSTAINER, AND MAINTAINER OF ALL THINGS. 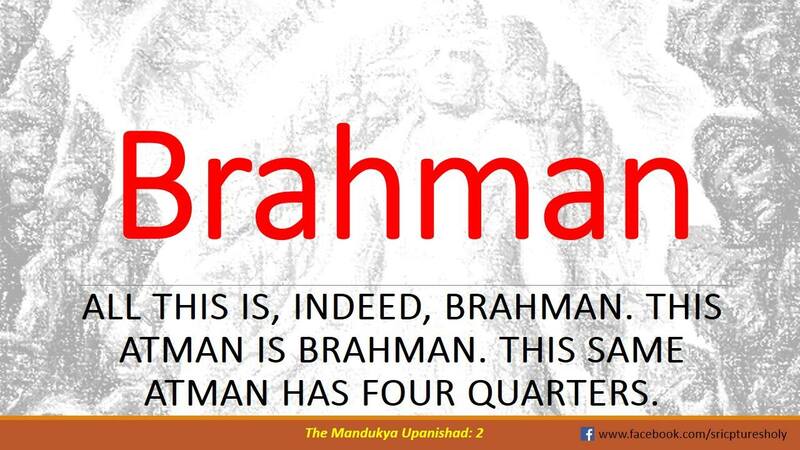 Atman – Brahman or man – God Dualism is the result of Constitutive – Regulative Dualism. 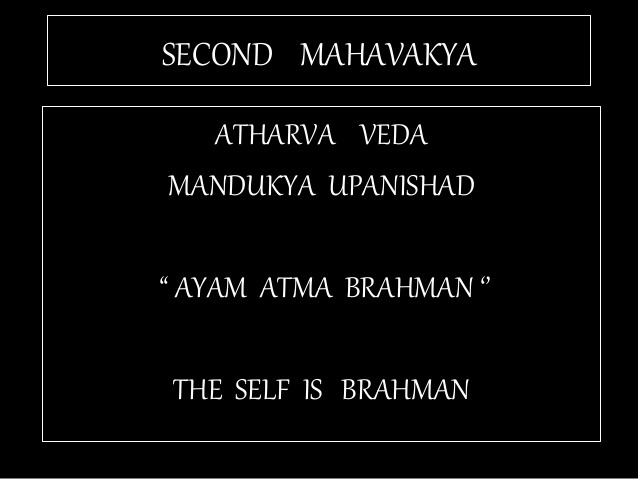 Atman is Brahman for there is Constitutive Unity between the two entities. 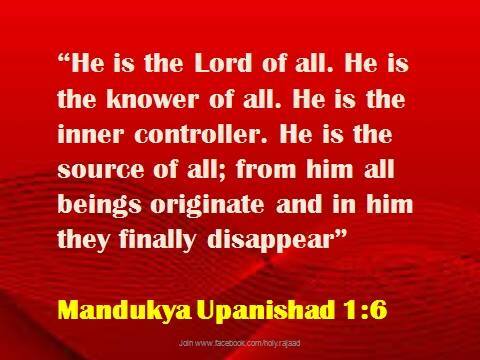 Between man and God there is Regulative Dualism for God is Ultimate Controller, Sustainer, and Maintainer of entire Universe. FIFTH MAHAVAKYA – “TAT ASMI PRABHO” – PRINCIPLE OF DEVOTION: ALL CHEMICAL ELEMENTS FOUND IN MATERIAL UNIVERSE CAN BE DESCRIBED AS UNBORN, ETERNAL, IMMORTAL, AND EVERLASTING AS PER THE FUNDAMENTAL LAWS OF CONSERVATION OF MASS AND ENERGY DESCRIBED IN CLASSICAL PHYSICS. 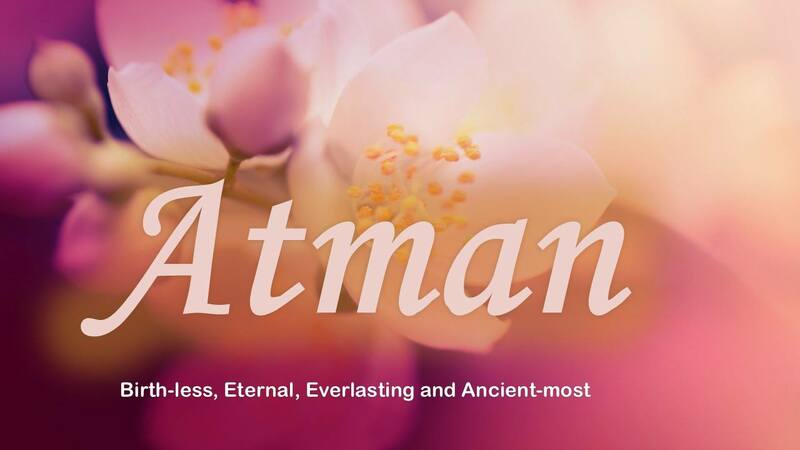 Atman is described as imperishable, immutable, immortal, everlasting, eternal, and even unborn. These attributes can be applied to all chemical elements found in material universe as per the Fundamental Laws of Conservation of Mass and Energy described in classical Physics. FIFTH MAHAVAKYA – “TAT ASMI PRABHO” – PRINCIPLE OF DEVOTION: THE SUBJECT AND THE OBJECT SHARE PERFECT IDENTITY. MAN – GOD DUALISM IS ABOUT DEGREE, DIFFERENCE IN POWER, OR EFFECTS OF SUCH POWER. Atman or Jeevatma, or Individual Soul may share perfect identity of Supersoul or Paramatma, or Universal Soul. Man – God Dualism is about ‘degree’, difference in power, or effects of such Power. God is different from man while God created man in His own image. God is different for He is the Supreme Being, Omnipotent, and His Power can reach all places. FIFTH MAHAVAKYA – “TAT ASMI PRABHO” – PRINCIPLE OF DEVOTION: MAN – GOD DUALISM CAN BE ACCOUNTED BY GOD’S REGULATIVE POWERS. ALL CREATED THINGS EXIST DEPENDING UPON GOD’S POWER, AND GOD EXISTS FULLY INDEPENDENT OF POWER USED BY ALL CREATED THINGS. Man – God Dualism can be described as separation of Regulative Power. All created things exist depending upon God’s power, or they live in God’s domain and God exists fully independent of power used by all created things. God seems to be telling, ” I am everywhere, and everything is in Me, but still I am aloof.” Lord Krishna, in the Divine Song called Bhagavad Gita, Chapter IX, RajaVidya, RajaGuhya Yoga, Most Confidential Knowledge of the Ultimate Truth, verse # 4 clarifies, ” I pervade all this creation. 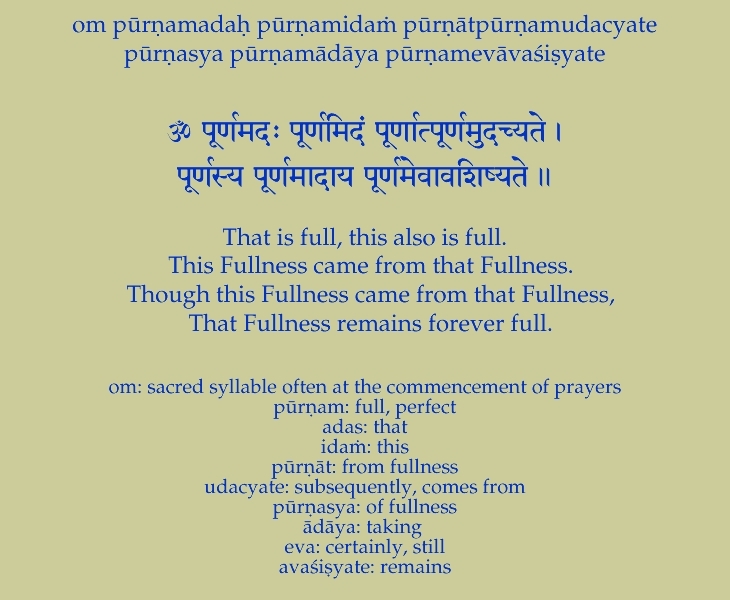 All things are resting in me, but I am not in them.” This separation of Regulative Power is further explained in Bhagavad Gita, Chapter XIII, Kshetra – Kshetrajna Vibhaga Yoga in verses 12 to 15: “It is called Brahman, the Spirit, and it lies beyond the cause and effect of this material world. The Supersoul is the original source of all senses, and yet He is without senses. He is unattached(“UDASIN” in Sanskrit language), although He is the Maintainer of all living beings. He transcends the modes of Nature, and at the same time is the Master of all modes of material Nature. 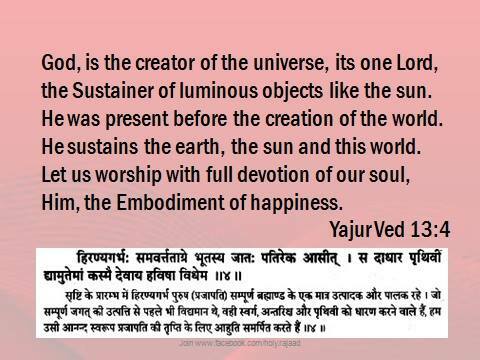 God is Controller, Master, Sustainer, Maintainer, Preserver, Observer, Sanctioner, and finally Enjoyer of His creation. FIFTH MAHAVAKYA – “TAT ASMI PRABHO” – PRINCIPLE OF DEVOTION: GOD HAS NOT SHARED HIS REGULATIVE POWER WITH MAN. MAN CANNOT RULE OR GOVERN HIS OWN BODY WHILE HE USES POWER SANCTIONED BY GOD. THE RECOGNITION OF GOD’S HIGHER POWERS WILL DIRECT MAN TO SUBMIT TO GOD’S SUPERIOR AUTHORITY. God has shared His nature and identity with man and may not have shared His higher Regulative Powers with which He controls all that He created. Man cannot rule or govern his own body while he uses power sanctioned by God to perform actions in material world. Recognition of God’s higher powers will direct man to submit to God’s superior authority. 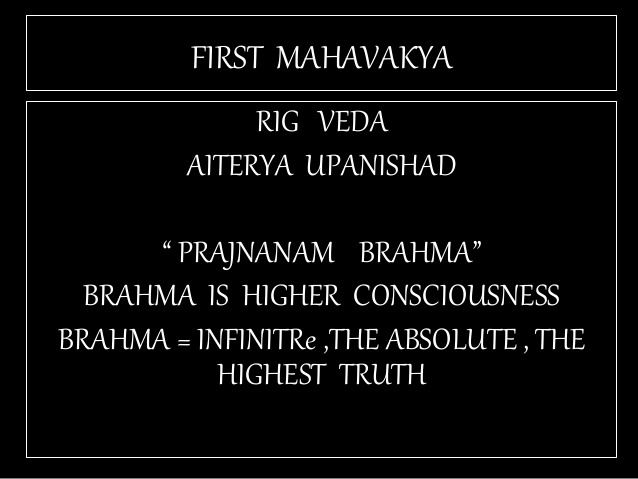 FIFTH MAHAVAKYA – “TAT ASMI PRABHO” – PRINCIPLE OF DEVOTION: MAN – GOD DUALISM. 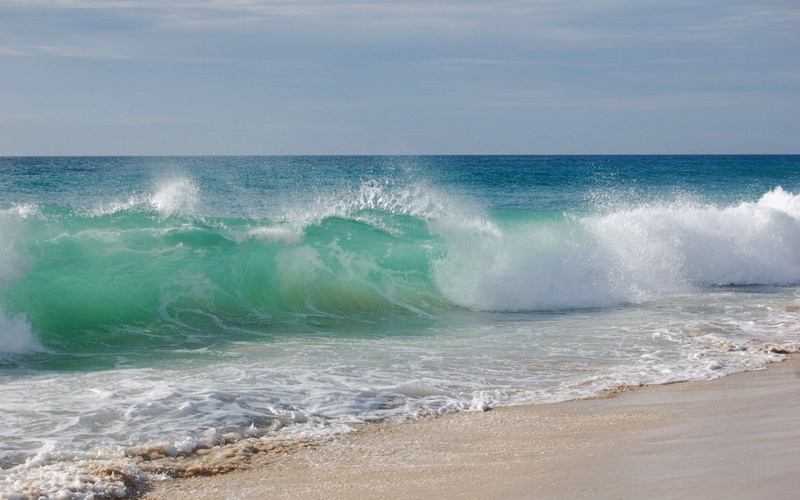 A DROP OF SEAWATER HAS SAME CHEMICAL IDENTITY AS COMPARED TO THE SEA TO WHICH IT BELONGS. THERE IS NO COMPARISON IF THE DISCUSSION IS ABOUT POWER WIELDED BY SEA. Man – God Dualism can be explained in terms of chemical identity of a drop of Seawater as compared to the Sea to which it belongs. There is no comparison if the discussion is about power wielded by Sea. FIFTH MAHAVAKYA – “TAT ASMI PRABHO” – PRINCIPLE OF DEVOTION: TWO CHEMICAL ELEMENTS, SODIUM AND CHLORINE COME TOGETHER TO FORM A CHEMICAL COMPOUND CALLED SALT. WHILE ATMAN AND BRAHMAN ARE ALIKE, THERE IS A DIFFERENCE IN DEGREE THAT CAN BE ESTIMATED BY MEASURING SALT NEEDED TO IMPART TASTE CALLED SALTINESS. Man – God Dualism can be explained as a difference in degree that can be estimated by measuring salt needed to impart taste called saltiness. A teaspoonful of salt is sufficient to impart salty taste to a cup of water. 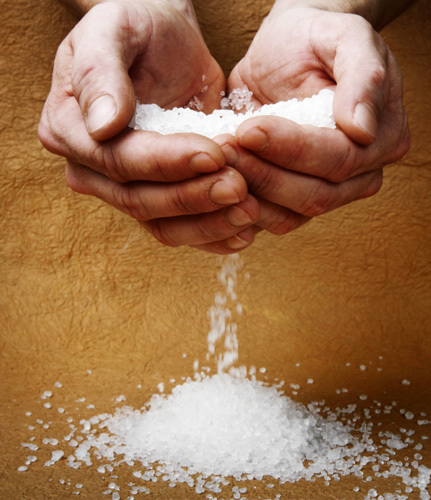 To make Seawater salty, the amount of salt required is enormous and the issue is about quantity as the volume of water involved is different. Brahman and Atman are identical, share same nature or “TATVA”, and the difference arises from the amount of salt needed if their nature is that of saltiness. FIFTH MAHAVAKYA – “TAT ASMI PRABHO” – PRINCIPLE OF DEVOTION: MAN – GOD DUALISM. UPANISHADIC APHORISMS ARE PRINCIPLES OF TRUTH ABOUT IDENTITY OR ESSENCE. EXISTENCE DEMANDS A VITAL FUNCTION CALLED BREATHING OR RESPIRATION. Upanishads are outpourings of Knowledge and Truth revealed by God and man has obtained this Knowledge and Truth. Yet the problem of man – God Dualism persists for man needs Divine Providence to perform a vital function called Breathing or Respiration. While man has access to Knowledge that accounts for his Essence, his Existence still demands God’s Mercy, Grace, and Compassion to make distinction between life and death. FIFTH MAHAVAKYA – “TAT ASMI PRABHO” – PRINCIPLE OF DEVOTION: SHANKARA, GREAT TEACHER OF INDIA RECOGNIZED THE DISTINCTION BETWEEN TEACHER AND HIS STUDENT OR THE BASIS FOR GURU – SISHYA RELATIONSHIP. SIMILARLY, THERE IS DIFFERENCE BETWEEN GOD AND HIS DEVOTEE. Shankara, India’s great teacher, founder of ‘Advaita’ School of Thought had recognized the distinction between Teacher and his student. Teacher is Source of Knowledge. Student is aspirant of Knowledge. Teacher imparts Knowledge and Student imbibes that Knowledge. On completion of learning process, Teacher and Student are identical in terms of learned Knowledge. That identity in terms of ‘Essence’ does not change the reality of Teacher – Student or Guru – Sishya relationship. Their relationship is formulated on the basis of devotion, aspirant of knowledge and wisdom using an attitude of respect and obedience, submits to authority of teacher, who is the source of information shared in the learning process. In ‘Eka Shloki’ composed by Shankara, the Disciple or Sishya, or Student finally acknowledges his successful learning of a lesson by addressing his Guru as “PRABHU” or LORD. For God is the ultimate source of Knowledge, the term ‘Prabhu’ or Lord can be interpreted as that of recognition of God’s honor, dignity, and majesty that makes Him as an Exalted One. The statement, “TAT ASMI PRABHO” not only describes Identity or Essence shared by man and God for both have Unity(signified by the term “ASMI”), but also it addresses God submissiveness and reverence. It transcends man – God Dualism by formulating a relationship using Devotion as an operating principle. FIFTH MAHAVAKYA – “TAT ASMI PRABHO” – PRINCIPLE OF DEVOTION: MAN – GOD DUALISM. LORD KRISHNA ACTING AS A TEACHER, MASTER, OR GURU IMPARTED KNOWLEDGE TO PRINCE ARJUNA. BUT, TO TRANSCEND THE BARRIER IMPOSED BY DUALISM, HE RECOMMENDED USING AN OPERATING PRINCIPLE CALLED ‘DEVOTION’ TO FORMULATE A RELATIONSHIP WHILE THERE IS UNITY BETWEEN MAN AND GOD IN TERMS OF ESSENCE OR IDENTITY. Does Truth lie beyond man’s reasoning power? Man can acquire true or real knowledge about his ‘essence’ and identity from reading holy scriptures like Upanishads. But, man’s reasoning power is not adequate to know the Ultimate Reality as there is fundamental dualism or separation of man and God. While Soul, Spirit, or Atman is an important operating principle to make distinction between living and non-living, or animate and inanimate things, its knowledge will not help man to transcend the difference imposed by God’s Regulative Power. 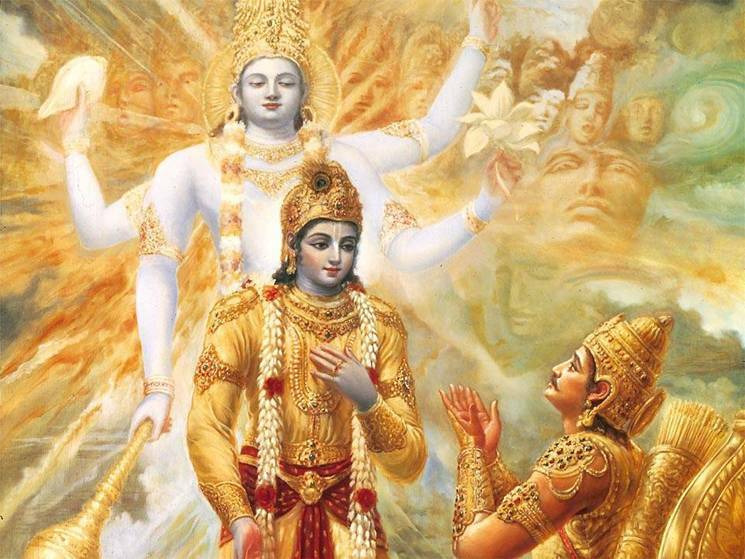 In Bhagavad Gita, Chapter X, The Infinite Glories of the Ultimate Truth or Vibhuti Vistara Yoga, verse # 10 Lord Krishna explained operating principle called ‘DEVOTION’ that will bring man and God together for man cannot know God using reasoning power. Fifth Mahavakya. Tat Asmi Prabhu. Principle of Devotion. FIFTH MAHAVAKYA – “TAT ASMI PRABHO” – PRINCIPLE OF DEVOTION: ACKNOWLEDGE GOD AS SUPREME BEING WITH SUBMISSIVENESS AND REVERENCE. FORMULATE MAN – GOD RELATIONSHIP USING OPERATING PRINCIPLE CALLED DEVOTION.